ABSTRACT—A general review of some of the theories proposed to account for the process of “bronze disease” is presented from both the historical and chemical points of view. The corrosion product of most serious concern, cuprous chloride, and its inter-relationship with some of the other important corrosion products of copper alloys, such as the copper trihydroxychlorides, is reviewed. The critical RH for the transformation of cuprous chloride is discussed and suggestions are made concerning both the storage conditions for bronzes and the variety of conditions under which cuprous chloride can occur in excavated bronze. THE CHEMICAL examination of the corrosion of copper and bronze artifacts has been the subject of study for at least 150 years. As long ago as 1826, Davy carried out an examination of a bronze helmet found in the sea near Corfu. Among the incrustations he was able to identify the ruby-red protoxide of copper (cuprous oxide: cuprite); the green rust of the carbonate (basic copper carbonate: malachite) and submuriate of copper (basic copper chloride: probably paratacamite or atacamite); crystals of metallic copper that had been redeposited; and a dirty white material identified as tin oxide. On a nail from a tomb in Ithaca that was analyzed and found to be a tin bronze with 6% of tin, Davy again found the protoxide, carbonate, and submuriate of copper, as well as tin oxide, although in this case there were no shiny crystals of redeposited copper present. The first scientific investigations of the aeruginous deposits on antiquities date from this period of the early 19th century and express the same curiosity about the nature and formation of these deposits we have today. This article summarizes the salient information published to date on the subject of cuprous chloride and bronze disease. Bronze disease may be defined as the process of interaction of chloride-containing species within the bronze patina with moisture and air, often accompanied by corrosion of the copper alloy itself, a process which has been more or less understood for the last 100 years. The products of the reaction are light green, powdery, voluminous basic chlorides of copper, which disrupt the surface and may disfigure the object. Several corrosion processes of copper are also enhanced by visible light. Cuprous chloride, for example, is a light-sensitive material and must be kept in the dark, preferably in a vacuum desiccator to prevent any chemical change. One theory concerning the origin of bronze disease attributed the problem to bacterial action. We now know that this is not the case, but the suggestion is not as silly as it sounds. Bacterial action has recently been thought to be a cause of black spots on bronzes (Madsen and Hjelm-Hansen 1979), although this theory is also unlikely to be true; a much more probable cause is the slow action of gaseous pollutants in showcases constructed of unsuitable materials that evolve sulfurous contaminants (Oddy and Meeks 1982). The best-known early attempt to deal with the problem of bronze disease is that of Berthelot, in 1895, who reported some of his proposals to account for the instability of certain bronzes. He recognized that there must be an important cyclical component to the reaction. He also realized that one of the important products of the reaction was the basic copper chloride, atacamite, which at that time was assigned the formula 3CuO,CuCl2,4H2O. The formula we know today for the copper trihydroxychlorides such as atacamite, Cu2(OH)3Cl (one of three isomeric compounds), translates closely into Berthelot's chemical terminology, which can be written as 3CuO,CuCl2,3H2O. Berthelot's explanation was a remarkable achievement for the chemistry of that time, especially since these basic copper chlorides are not well known even today. The three isomers—botallackite, atacamite and paratacamite—belong to different crystallographic groups. Botallackite is monoclinic, atacamite is orthorhombic, and paratacamite is rhombohedral. Botallackite is the least stable of the three, and its instability accounts for the rare instances in which it has been identified as a component of copper corrosion products on real objects from burial. This completes the series of reactions that convert copper, oxygen, and water to cuprous oxide and atacamite in a cyclical process. Berthelot states that the constant recurrence of the process under the influence of oxygen and moisture is the cause of bronze disease. Berthelot's essential conclusion—that the recurrence is due to a cyclical reaction involving both oxygen and moisture—is indeed correct. More is known about the process today, but we still do not know all the details of the corrosion chemistry involved. The equations that Berthelot advanced and that are reproduced here are not, however, accurate descriptions of bronze disease. Although the idea of the cyclical reaction is accepted, the principal cause of instability in excavated bronze objects is due to the existence of cuprous chloride formed during corrosion processes in burial. This cuprous chloride is not usually exposed to view but is present as a corrosion product, often close to the surface of the residual metal. NOT ALL bronzes suffer from the presence of cuprous chloride, the mineral nantokite. The mineral form was first identified and named from the mines near Nantoko, Chile (Palache et al. 1951). Cuprous chloride can occur as massive granular lumps or, in laboratory-made samples, as tetrahedral crystals. The mineral is isotropic, with refractive index 1.930, and under the polarizing microscope may show anomalous birefringence, especially at the edges of the sample when mounted in Melt Mount (refractive index 1.66). The material usually occurs on copper alloys as a gray or gray-green translucent waxy solid that can easily be cut with a scalpel or a fingernail, since the hardness is only 2.5 on Moh's scale. above a cuprite layer. The cuprite layer is adjacent to the metal surface and the cuprous chloride is usually covered by malachite or basic copper chlorides. in the central core of the object, replacing previous metallic areas. In some cases these objects may be totally mineralized. If all the cuprous chloride has transformed, these mineralized objects will be chemically stable and require little conservation treatment in terms of stabilization, although they are physically very fragile. Objects studied by the author show considerable variation in the extent to which surface disruption occurs with time. A number of bronze objects from Palestine are in the Petrie Collection, Department of Western Asia, Institute of Archaeology, University College, London. One of these objects, which had obviously suffered severe bronze disease and had been stored in uncontrolled conditions for more than 20 years, was examined and analyzed. The light green corrosion was identified as a mixture of atacamite and paratacamite, the most commonly found mixture of isomers in many ancient bronzes regardless of the location in which they are found. Most of the small objects in this collection illustrate the effects of disintegration in poor storage conditions over many decades. Little change is now evident, and many of the objects have stabilized themselves by reaction of the cuprous chloride with moisture. Some of these objects could be described as metastable, for they contain cuprous chloride at some depth and if cut or sectioned cuprous chloride in the unreacted state may still be found. Objects, of course, cannot necessarily be left to stabilize themselves over long periods of time without disintegration and loss of material, which would be unacceptable. It should be recognized, however, that disfiguring light green corrosion excrescences on ancient bronzes do not necessarily imply that the bronzes are still unstable, even though they were excavated many years ago and kept in uncontrolled storage since that time. Some of these objects are reduced to fragmented heaps of light green powder, but those that survive may now be quite stable. The ability of cuprous chloride to lie dormant until exposed to the atmosphere is unusual. In many other metals the presence of chlorides creates immediate instability, as in the case of iron, steel, and cast iron, in which the chlorides are water soluble and undergo chemical change quite quickly in burial environments. The relative stability and insolubility of cuprous chloride in unexposed pits create problems in the mechanical cleaning of ancient bronzes, since the exposure of such pits usually necessitates further stabilization measures or monitoring procedures. In some cases, especially where warty corrosion is present and it is desired to clean the warts down to the level of the rest of the patina, the exposure of cuprous chloride can create considerable problems with stability. In such cases aesthetic and practical decisions have to be made concerning the object. Is it better to leave the object with unaesthetic warty corrosion, or can the warts be cleaned and the object be either treated or kept in controlled storage and properly monitored? The problem with this model was that in isolation the first reaction, that of cuprous chloride with water, will not produce hydrochloric acid and cuprite. As MacLeod (1981) has already pointed out, the ΔG of reaction for equation  is +16.3 kcal. mole−1, showing that the reaction will not proceed spontaneously because of the positive value of ΔG. The thermodynamic values used in this discussion refer to the standard free energies of formation of the compounds from the elements and are therefore in the standard state at 25°C. As such they can only be used as a guide to the reactions that will actually occur, for under bronze disease conditions most reactants will not be in their standard states. Nonetheless, they are offered here as a model for further refinement and discussion. In standard conditions, the positive sign of the ΔG of reaction for the hydrolysis of nantokite means that the reaction cannot proceed as such without an additional thermodynamic driving force. In addition, nantokite has a solubility of about 0.006 g per 100 ml of water at room temperature; this low solubility limits the extent to which hydrolysis reactions may occur. It is possible to provide a thermodynamic thrust to the right hand side of equation  if the positive ΔG can be overridden by other factors. One of the factors that must be considered is the presence of alloying elements: tin in bronze or zinc in brass for example. If a drop of water is added to cuprous chloride spread over the surface of a piece of brass, gas bubbles evolve from the droplet and a film of cuprite develops on the brass surface. The equation Organ proposed (1963) is therefore operative; the driving force of the zinc in the brass is sufficient to promote the generation of hydrogen. The same reaction on a sample of a high tin bronze (24% tin) is not sufficiently favorable to produce cuprite as an immediate product, even though the ΔG of reaction of tin with hydrochloric acid is −8.856 kcal. mole−1. There are, of course, electrochemical factors and kinetic factors to be considered here. There is obviously an additional driving force for the reaction if carried out on a metal surface lower in the electrochemical series than copper, which is one reason why the reaction with brass is so rapid. Not only are there subtle electrochemical factors to be considered concerning the difference in potential between tin-rich phases and the copper-rich alpha phase in bronzes, but there are a variety of burial conditions to be considered. A simple examination of the likelihood of the tin- or copper-rich phases corroding suggests that tin would be the most likely to corrode. The enthalphy of formation of cuprous oxide or cupric oxide is some 100 kcal. mole−1 less than that for stannic oxide, which should mean that loss of tin is the preferred reaction when the bronze corrodes. But corrosion of the copper-rich phase or the tin-rich phase is mostly dependent on the partial pressure of oxygen, as shown by the work of MacLeod (Taylor and MacLeod 1985). In seawater, MacLeod found that exposure to well-oxygenated conditions resulted in the copper-rich alpha phase being attacked, while in less oxidizing conditions the tin-rich delta phase was attacked. The concentration of tin compounds or copper compounds that might form in the patina will therefore be strongly affected by this selective corrosion phenomenon. What happens in practice when cuprous chloride is in contact with copper and a drop of water is added? In this case there is no cuprite formation; the copper trihydroxychlorides are the principal products. The standard way of making paratacamite, namely the immersion of a sheet of copper in a solution of cupric chloride, produces first a thin layer of cuprite over the copper followed by a layer of paratacamite. Cuprite can be formed as a thin layer adjacent to copper if cuprous chloride and copper are mixed together and regularly moistened with water, but this is not the principal reaction. On copper, cuprous chloride slurries develop a pH of about 3.5–4.0, and the solution develops a green precipitate; one of the copper trihydroxychlorides is formed (Tennent and Antonio 1981). The reaction is one of oxidation and hydrolysis of the cuprous chloride, which takes place with a negative free energy of formation. This equation has been written using a value for the free energy of formation of paratacamite of −319.8 kcal. mole−1. When cuprous chloride is placed on moist filter paper, the cuprous chloride slowly changes to give mostly atacamite, as reported by Tennent and Antonio (1981). The work of Sharky and Lewin (1971) established that one of the critical factors involved in whether one copper trihydroxychloride isomer or another is formed during possible transformations leading to the formation of atacamite or paratacamite was the concentration of complex cupric chloride ions in solution. Lewin (1973) argued incorrectly that the concentration of the complex copper ions in solution during natural corrosion processes in the soil would be low. With low concentrations, paratacamite is the most favored product, and Lewin posited that the detection of a mixture of paratacamite and atacamite in a patina implied that the corrosion was artificially induced. Lewin's argument suffers from two serious drawbacks: first, the x-ray diffraction data for several natural patinas examined by different laboratories has established that, indeed, all three isomers may be present and not limited to paratacamite; and second, low copper chloride ion concentrations have not been confirmed by in situ studies. Giangrande (1987), for example, examined samples of corrosion products from several ancient objects and, in cases where the copper trihydroxychlorides were identified, mixtures of paratacamite and atacamite were common. Pitting corrosion in both iron and copper leads to a buildup of chloride ions beneath the pit, which functions as an electrochemical cell. Lucy (1972) observed the growth of crystalline cuprous chloride in the pitting corrosion of copper. These pits were shown to function as electrochemical cells. The cuprite that formed over the cuprous chloride not only acts as a diffusion barrier that reduces the loss of dissolved copper ions into the outer zone but also as a bipolar electrode, with an anodic reaction taking place on the inner surface of the cuprite and a cathodic reaction occurring on the outer surface. Cuprous ions diffuse through the cuprite and can become oxidized by oxygen in water to form cupric ions. Some of these cupric ions can be lost into the soil groundwaters, some may be precipitated as basic salts, and some can be reduced back to the cuprous state at the outer membrane surface. Lucy proposed that the balance between equations , , and  was responsible for the precipitation of cuprous chloride. If, however, as a result of equation , the rate of formation of cuprous ions exceeds conversion into cuprite or cupric compounds, then a layer of cuprous chloride can form. The work of Pourbaix (1976) suggested that similar products were formed in the corrosion pits studied on copper that had been attacked by domestic water. The potential-pH equilibrium diagram for the ternary system Cu-Cl-H2O for solutions containing 10−2 g-ion Cl−/liter, which is about the amount of chloride ion present in a solution saturated in CuCl, is shown in figure 1. 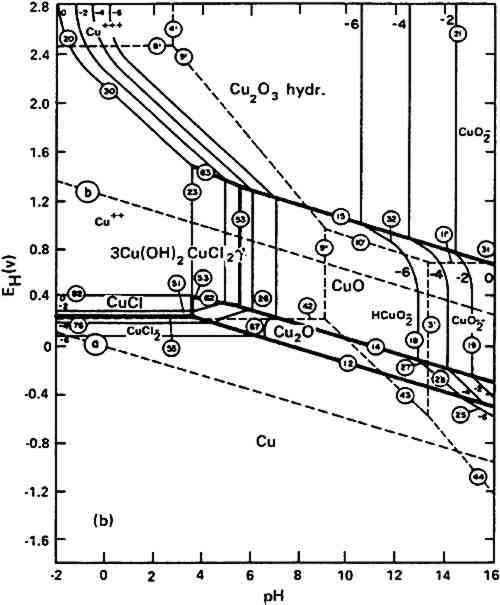 In neutral solutions, at pH 7, the diagram suggests that CuCl should hydrolyze according to equation , but such neutral conditions are not encountered inside corrosion pits where copper, cuprite, and nantokite coexist. Fig. 1. Pourbaix diagram for the system copper-chlorine-water at 25°C and a chloride ion concentration of 10−2 g-ion per liter (3550 ppm), which is approximately a solution saturated in chloride ion over cuprous chloride. The diagram indicates that at neutral conditions of pH and Eh cuprous chloride should hydrolyze to cuprous oxide. In bronze disease pits, conditions are usually acidic (between pH 3 and 5) and at these pH values CuCl may change in more oxidizing conditions to give gamma 3Cu(OH)2CuCl2. This is simple paratacamite written in a different way. Pourbaix's original work, from which this diagram is taken (Pourbaix 1976), dealt with the corrosion pitting of copper tubes used for the delivery of Brussels tap water. Pits filled with cuprous chloride and covered with cuprite and malachite would form in the tubes. Examination of the Pourbaix diagram suggests that these three components will be stable at a pH of 3.5 and an E of +270 mVshe. Under these conditions the corrosion reaction is reversible: the pit will grow if the electrode potential inside the pit is higher than +270 mVshe, while the growth will stop and metallic copper can be redeposited if the electrode potential is lower than +270 mVshe. The equilibrium values expected for the pH in corrosion crusts where copper, cuprite, and nantokite are present are therefore acidic and will contain potentially high amounts of complex copper chlorides and therefore act contrary to the model proposed by Sharkey and Lewin (1971). Sharkey and Lewin found that when the CuCl+ concentration reached 20%–30% of the copper ions in solution at a pH of about 4, then atacamite was favored over paratacamite; with still higher copper complexes, such as CuCl2, CuCl3−,CuCl42−, paratacamite once again became the favored species. There is potential for great variation in the concentration of the complex cupric ions in solution, and it is difficult to envisage how the relative amounts of the different isomers can be used to obtain any useful information on burial conditions. The relationship between cuprous chloride and other copper hydroxychlorides, such as calumetite, is less clear. Calumetite—copper hydroxychloride, Cu(OH)Cl—has been identified only a handful of times in the natural patina of ancient bronzes by the work of Nielsen (1977), Meyers (1977), and Helmi and Iskander (1985). Calumetite is at present enigmatic: the conditions under which this mineral can form are not known and, in addition, it is not known whether calumetite may have been formed on the bronzes in question as a result of chemical cleaning treatment. However, since it is known as a mineral and has been found in widely disparate objects it deserves serious attention. Sharkey and Lewin (1971) found that there was no dimorphic interconversion between paratacamite and atacamite under the conditions they investigated. It has been assumed that the relative proportions of the isomers could afford some clue to provenance or perhaps authenticity of the patinas of different objects. This assumption is not really feasible for the reasons that have been discussed above; the proportions may vary on one object sampled from different locations depending on whether the object has incipient bronze disease and fresh outbreaks of one of the copper trihydroxychlorides have occurred, or the original patina constituents are examined. Even under laboratory conditions the mode of production of the basic chlorides is very critical. If cupric chloride solution is added to calcium carbonate and stirred then atacamite is produced, but if left unstirred then botallackite is formed (Tennent and Antonio 1981). Subtle factors control the conditions under which the different products may form. Some reactions are more repeatable than others. For example, the reaction between cuprous chloride, copper foil, water, and air in an experiment carried out by the author gave mostly paratacamite, in agreement with most of the previously reported results, while the same reaction, replacing cuprous chloride with cupric chloride, gave a mixture of paratacamite and atacamite, with more atacamite. Tennent and Antonio found that the latter reaction invariably produced paratacamite. Unless all the parameters of the reactions, such as pH, temperature, time, and molar concentrations, are carefully controlled, the end products of these reactions cannot be predicted with certainty. A series of experiments was conducted by Scott and O'Hanlon (1987) using a variety of cuprous chloride powders; some were freshly made in the laboratory and stored under nitrogen, while others were commercial products. The chemicals used in this series of experiments were all analytical grade reagents with very low levels of impurities present (less than 0.1%). The reaction products were sampled after a period of 5 days, and the temperature employed was room temperature (20°C). The experimental work was conducted to determine what the most common products would be when different combinations of the following reactants were employed: copper foil, cuprous chloride, and sodium chloride, cuprous oxide. Analysis was carried out by x-ray powder diffraction using a Debye-Scherrer camera and by Fourier transform infrared spectroscopy. Cuprous chloride was laid out on filter paper and exposed to 70% RH. The most common product of this reaction is atacamite (Frondel 1954), but mixtures of paratacamite and atacamite have also been noted. Copper foil was suspended in a solution of 0.02M cupric chloride and stirred for 48 hours. The product of this reaction is paratacamite (Feitknecht and Maget 1949). Calcium carbonate powder was reacted with 0.13M cupric chloride. The product has usually been identified as botallackite. Copper foil was sprinkled with cuprous chloride crystals and exposed to 70% RH for 5 days. The product is mostly paratacamite (Tennent and Antonio 1981). Copper powder was sprinkled with cupric chloride dihydrate and exposed to 70% RH for five days. The product is a mixture of paratacamite and atacamite. Copper foil was sprinkled with sodium chloride and exposed to 70% RH for 5 days. The product is mostly paratacamite. Cuprous chloride powder was mixed 50:50 by weight with sodium chloride and exposed to 70% RH for 5 days. The product is a mixture of paratacamite and atacamite. Cuprous chloride powder was mixed 50:50 by weight with cuprous oxide and exposed to 70% RH for 5 days. The products are a mixture of atacamite and paratacamite. The same series of reactions was also attempted under nitrogen. If oxidation and hydrolysis of cuprous chloride is the principal reaction, then placing the reactants in an inert atmosphere should result in very little or no reaction. This was indeed found to be the case, and in most of the reaction mixtures only slight alteration could be found after analysis by x-ray powder diffraction. The experiments above illustrate the comparative difficulty of synthesis of botallackite under ordinary laboratory conditions, a fact borne out by the analysis of the products of bronze disease on antiquities: botallackite is rarely reported, while paratacamite and atacamite predominate. Some of the experiments were designed to see what products might be expected from the reaction between copper metal and sodium chloride to simulate events that may occur in highly saline environments, as well as to determine the reactions between cuprous chloride and copper foil in the presence of moist air or with added water. It is interesting that the cuprite in experiment 8 is attacked during the reaction with cuprous chloride and the red color of cuprite gradually changes, the whole mass becoming pale green. It is clear that cuprite is vulnerable to attack under extreme conditions. This characteristic has potential importance, for the original surface detail of some objects, which is preserved in cuprite, could be disrupted and suffer alteration as a consequence of reaction with cuprous chloride and moisture. No change was observed in a similar experiment where the cuprous chloride was replaced by sodium chloride. Reaction did ensue between copper powder and sodium chloride with the formation of atacamite. Although more complex reactions may sometimes occur in highly saline environments, leading to complex copper salts, such a reaction was not observed here. As a result of the increase in chloride ion concentration that is a necessary consequence of equation , a whole series of copper chloride species becomes possible in the burial environment, where further reaction with copper or copper corrosion products could lead to the formation of complex species such as CuCl2, CuCl3−, CuCl42−. Indeed, Fabrizi and Scott (1987) found crystalline eriochalcite, CuCl2.2H2O, occurring as a corrosion product on a copper alloy object from Memphis, Egypt. This is a noteworthy occurrence, since high chloride ion contents of Egyptian soils can lead to the formation of unusual products. Eriochalcite may also be formed as a result of the alteration of nantokite in the laboratory. It could not, of course, survive in moist conditions since eriochalcite is soluble in water, but the site was a dry one and showed unusual corrosion products, such as sampleite, which is discussed in detail by Fabrizi et al. (1989). There is still much to be understood about the chemistry and pH conditions that prevail in copper objects and lead to an accumulation of cuprous chloride in the corrosion products. The cupric complexes must play an important role in the continued reactions giving rise to bronze disease before either all of the cuprous chloride is consumed or the humidity levels in pits or in zones contiguous with the surface drop below levels required for continuous reaction. SOME OF the aspects of water layers formed on copper surfaces exposed to the atmosphere have been reviewed by Graedel (1987). Several monolayers of water can be adsorbed onto the surface of pure copper at moderate or high humidities. At an RH of 60% and a temperature of 20°C, for example, the number of water monolayers on a metal surface is estimated to be 15, while at 90% RH the number of layers is about 27. Current views in surface chemistry suggest that when the number of monolayers rises above three, the layer possesses the chemical properties of bulk water. The kinds of surface interaction phenomena discussed here are quite different than those found on a pure metal, and they involve corrosion products of copper and tin as well as impurities that may exist within the alloy. Structural defects in crystalline phases and grain boundary effects may well play a role, too. Clearly, the potential exists for some reactions to continue independent of the critical RH for the transformation of cuprous chloride and for variations in stability to be apparent with different objects. What is the best model for the RH values for storage that we currently have? It has been proposed as a result of empirical observations in museum collections that unstable bronze artifacts must be stored at an RH of less than 39% if the reactions of cuprous chloride are to be stifled. The situation is complex for a variety of reasons. First, the critical RH value for cuprous chloride in air in isolation from a metallic substrate is higher than 46% RH. An experiment was conducted by the author for two years in which compressed tablets of cuprous chloride (which becomes waxy when consolidated by compression in an IR press), powdered cuprous chloride, and copper powder mixtures were kept in a humidity cabinet over a saturated salt solution providing a humidity that only fluctuated between 42% and 46% RH during the period of the experiment. No observable change in either the pure cuprous chloride or the powder mixture occurred. Samples of the copper powder were mounted in resin for microscopic examination and polished for metallographic study. No change could be observed at the interface between the cuprous chloride particles and the copper substrate, showing that if any reaction had occurred it was quite negligible: the copper survived more or less intact. When the same experiment was conducted at an RH of 70%, reaction was rapid; within a day the compressed cuprous chloride tablet exfoliated and burst as it changed to one of the copper trihydroxychlorides. Samples of polished copper sessile beads covered with crystals of cuprous chloride to which droplets of water are added periodically develop a waxy crust of cuprous chloride adjacent to the metal surface, with a covering principally composed of paratacamite. If the waxy layer that adheres to the copper is removed with a scalpel, clear indications are found that the copper surface has been attacked. The surface is dull and etched by the reaction with cuprous chloride under these conditions of wetting and drying. In relation to copper, cuprous chloride has a relative molar volume (RMV) of about 3.36, while the copper trihydroxychlorides have RMVs of about 3.99. A considerable force for expansion exists as a result of this transformation; the relative molar volume increase is even more marked compared with cuprite, which has an RMV of 1.67. An unknown factor in coming to a conclusion concerning critical RHs for objects is the potential role that could be played by the existence of chloro-complexes of copper within the corrosion crust. Their effect, coupled with the uncertainty as to the presence of adsorbed water or internally trapped water due to microcapillarity, will be to produce continued activity until the object has either reacted with the available water or has dried out before the available cuprous chloride is exhausted. It is clear, however, that there is no reason per se to reduce the RH of stored bronzes that are not showing signs of active corrosion to levels below 39%. Storage at an RH between 42% and 46% should provide adequate conditions for most objects. The humidity should not be allowed to rise above 55% because the reactions of cuprous chloride become very rapid as the RH rises and will not necessarily stop as soon as the RH is lowered again. Although the reactions reviewed here suggest a cyclical process in the absence of further contamination the process will stop or will slow to low rates of reaction when the cuprous chloride has been transformed. The sound metal remnants comprising part of the object (if any metallic component was extant upon excavation) can suffer attack during the process, but attack of the remaining metal itself will not be appreciable, especially if the RH is kept below 46%; the primary problem is the cuprous chloride that is transforming, together with the potential effects of the alteration of cuprite within the patina. THIS ARTICLE has attempted to review some of the relevant information concerning bronze disease and to suggest that more work is required to understand precisely all the variables involved in the process. Some of the more important points are summarized here. The presence of paratacamite or atacamite on the surface of a bronze object does not necessarily mean that the object is undergoing active corrosion. Further research is required on the basic copper chlorides to understand in more detail their chemistry and their interrelationships with cupric complex species, particularly in the case of calumetite. The location of cuprous chloride within the patina constituents can vary. In some cases it is adjacent to the metal surface, but in other examples it may overlie cuprite or be sandwiched between cuprite layers. The problems of the appropriate RH for the storage of bronzes has been examined, and, for the majority of bronzes, an RH between 42% and 46% was found to be sufficient; cuprous chloride will not undergo chemical reaction at this humidity level, which already incorporates a margin of safety. More problematic objects may require lower levels. Testing this hypothesis is not easy, since bronzes are often treated and stored at low humidity in the conservation laboratory and then returned to display or storage after treatment; there the RH levels may be much higher, making continuous assessment of the situation difficult. Since the cost of maintaining an RH of 39% is high, further museum work will be required to ascertain if the recommendation of 42% to 46% RH can be confirmed as soundly based. Berthelot, M.P.E.1895. Etude sur les metaux qui composent les objets de cuivre de bronze, d'étain, d'or, et d'argent, découverts dans les fouilles de Dahchour, on provenant du Musée de Gizeh. In Fouilles à Dahchour, ed.J. deMorgan. Vienna: A. Holzhausen. 131–46. Davy, J.1826. Observations on the changes which have taken place in some ancient alloys of copper. Philosophical Transactions of the Royal Society of London116(2):55–59. Fabrizi, M., H.Ganiaris, S.Tarling, and D. A.Scott. 1989. The occurrence of Sampleite, a complex copper phosphate, as the principal corrosion product on ancient Egyptian bronzes from Memphis, Egypt. Studies in Conservation34:45–51. Fabrizi, M., and D. A.Scott. 1987. Unusual copper corrosion products and problems of identity. In Recent advances in the conservation and analysis of artifacts, comp. J. Black. London: Summer School Press. 131–33. Feitknecht, W., and K.Maget. 1949. Zur Chemie und Morphologie der basischen Salze zweiwertiger Metalle. XIV Die Hydroxychloride des Kupfers. Helvetica Chimica Acta32:1639–53. Frondel, C.1954. Paratacamite and some related copper chlorides. Mineralogical Magazine29:34–45. Giangrande, C.1987. Identification of bronze corrosion products by infrared absorption spectroscopy. In Recent advances in the conservation and analysis of artifacts, comp. J. Black. London: Summer School Press. 135–48. Graedel, T. E.1987. Copper patinas formed in the atmosphere, II: A qualitative assessment of mechanisms. Corrosion Science27:721–40. Helmi, F. M., and N. Y.Iskander. 1985. X-ray study, treatment and conservation of Rameses II's stove from the Egyptian Museum, Cairo. Studies in Conservation30:23–30. Lewin, S. Z.1973. A new approach to establishing the authenticity of patinas on copper-base artifacts. In Application of science in examination of works of art, ed.W. J.Young. Boston: Museum of Fine Arts. 62–66. Lucy, V. F.1972. Developments leading to the present understanding of the mechanism of pitting corrosion in copper. British Corrosion Journal7:36–41. MacLeod, I. D.1981. Bronze disease: An electrochemical explanation. Institute for the Conservation of Cultural Materials Bulletin7:16–26. Madsen, H. B., and N.Hjelm-Hansen. 1979. Black spots on bronzes: A microbiological or chemical attack. In The conservation and restoration of metals, Proceedings of the symposium, Edinburgh. Glasgow: Scottish Society for Conservation and Restoration. 33–39. Meyers, P.1977. Technical examination of an Achaemenid bronze mirror, from the collection of Norbert Schimmel. In Bibliotheca Mesopotamia, ed.GiorgioBuccellati. Malibu, Calif.: Undena Publications. 7:196–98. Nielsen, N. A.1977. Corrosion product characterization. In Corrosion and metal artifacts, ed.B. FloydBrown et al. NBS Special Publication 479. Washington, D.C.: U.S. Department of Commerce. 17–37. Oddy, W. A., and N. D.Meeks. 1982. Unusual phenomena in the corrosion of ancient bronzes. In Science and technology in the service of conservation, ed.N. S.Brommelle and G.Thomson. London: International Institute for Conservation of Historic and Artistic Works. 119–24. Organ, R. M.1963. Aspects of bronze patina and its treatment. Studies in Conservation8:1–9. Palache, C., H.Berman, and C.Frondel. 1951. Dana's system of mineralogy. 7th ed.New York: John Wiley and Sons. 2:18–19. Pourbaix, M.1976. Some applications of potential-pH diagrams to the study of localized corrosion. Journal of the Electrochemical Society123(2):25c–35c. Scott, D. A., and J.O'Hanlon. 1987. The analysis of copper trihydroxy-chlorides and their occurrence as corrosion products on bronze antiquities. Unpublished internal report. London: Department of Chemistry, University College. Sharkey, J. B., and S. Z.Lewin. 1971. Conditions governing the formation of atacamite and paratacamite. American Mineralogist56:179–92. Taylor, R. J., and I. D.MacLeod. 1985. Corrosion of bronzes on shipwrecks: A comparison of corrosion rates deduced from shipwreck material and from electrochemical methods. Corrosion (National Association of Corrosion Engineers) 41:100–104. Tennent, N. H., and K. M.Antonio. 1981. Bronze disease: Synthesis and characterisation of botallackite, paratacamite and atacamite by infra-red spectroscopy. ICOM Committee for Conservation preprints, 6th Triennial Meeting, Ottawa. 81/23/3–1—81/23/3–11. DAVID A. SCOTT, B.Sc., B.A., Ph.D., C.Chem. MRSC, FIIC, has been head of Museum Services of the Scientific Program at the Getty Conservation Institute since 1987. He has been a lecturer in conservation at the Institute of Archaeology, University of London, Department of Archaeological Conservation and Materials Science, and, since 1984, an editor of Studies in Conservation. He was named a fellow of the International Institute for Conservation in 1989. His principal research interests are the analysis and technical study of ancient metallic objects and their corrosion products, the conservation of metallic artifacts, the study of Chumash Indian rock art and the archaeometallurgy of ancient South America, particularly Colombia and Ecuador. Address: The J. Paul Getty Museum, P.O. Box 2112, Santa Monica, Calif. 90406.